I've been having a blast making handmade journals for Literary Luxe. I print all of the designs and filler paper right here in my work space and I cut each journal to the perfect size. I use these myself, especially on the go and in my college classes. One day, while making a dozen journals, JD came over and plunked down on top of my cutting mat and stared at me with his huge, brown eyes. 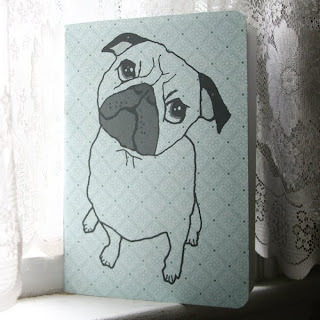 It was clear that he wanted to be a part of my paper working, so I decided to bring all new dog journals to the All You Need Is Pug shop! Each journal is one of a kind, as I have so many papers and binding threads that no two journals will ever have the same color combination. I hope that many animal lovers will adopt my journals and use them for daily jots, inspiration, and collecting their special thoughts! What do you write when you keep a journal?